Our railroad land consists of two tracts of land in Schuyler County near Ray, Illinois that total more than 10 acres as well as 6.48 acres in Fulton County, south of the town of Vermont. All three of these tracts were previously part of the Burlington Northern and Santa Fe Railway Company's (formerly Chicago, Burlington & Quincy Railroad Corporation) branch line from Vermont to Rushville, Illinois. Each parcel is 100 foot wide, with 50 feet on each side of the former track centerline. The railroad was discontinued and the tracks pulled up many years ago and the properties have since returned to their natural state, with towering Cottonwood and White Oak trees shading the path of the former railroad. Little evidence of the property's prior use remains except for the flat land that served as a bed to the railroad and now makes an excellent trail. Access to these tracts is difficult (one must be accessed by canoe or kayak) so they are currently being left as a natural area to continue in their restoration. 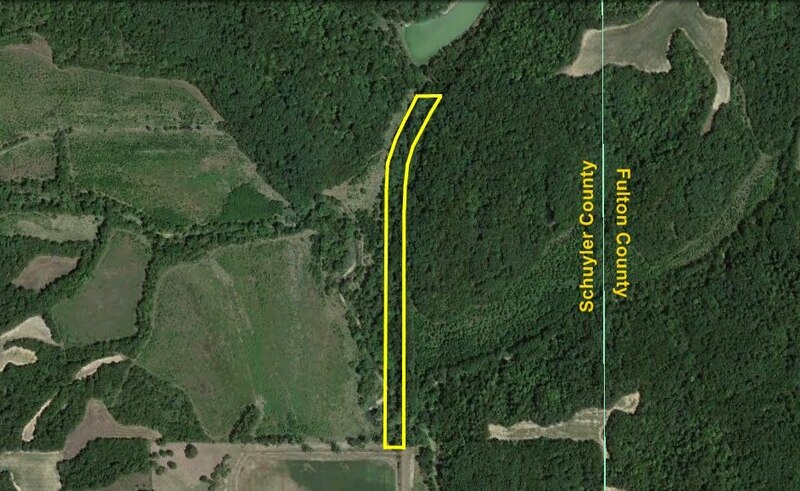 Tract A (shown below) is approximately 6.6 acres located on the east side of Schuyler County near the Fulton County line. This tract has beautiful Sugar Creek cutting through it on the very south side of the property. It is bordered on the east by steep wood hillsides and on the west by a tributary to Sugar Creek. It features beautiful scenery and massive hardwood trees on each side of the former railroad. The property is well marked with fences and fenceposts. Access to this tract is restricted with its only public access point being Sugar Creek. Below is a web album with numerous pictures of Tract A and the surrounding area, including Sugar Creek. 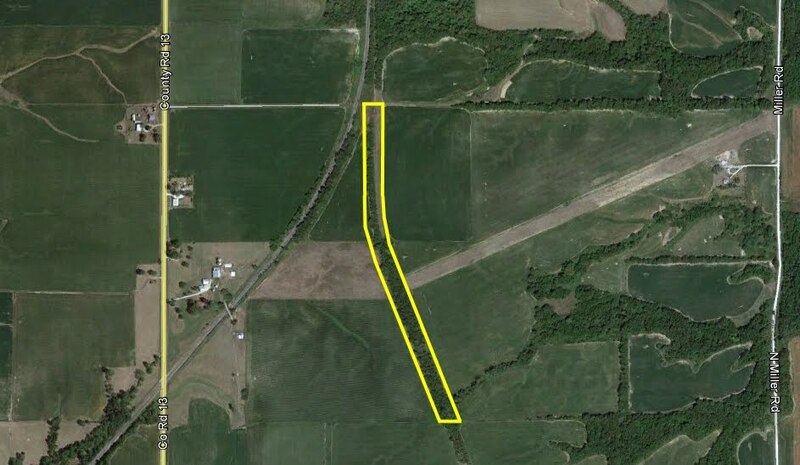 Tract B (shown below) consists of 5.41 acres of land located 0.7 miles southwest of Ray, Illinois. 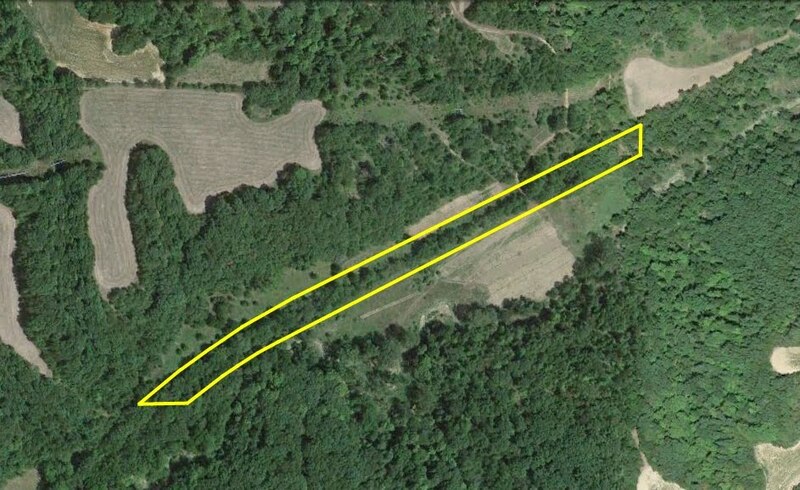 Tract C (shown below) consists of 6.48 acres about 1.4 miles south of Vermont, Illinois. The web album below shows pictures of Tract C taken in August 2012, including a wild American Badger that we encountered!